Discussion in 'Indian Air Force' started by Virajith, Mar 5, 2013. After the tragic crash of its second prototype in March 2009, in which the three-member IAF test crew was killed, the NAL Saras light transport aircraft, is expected to take to the air again this month. The first prototype has been suitably modified (now designated PT1N) and is likely to make a flight by the end of March. The modifications to the first prototype include changes to the rear fuselage, increased area rudder, modified stub wings, new engine nacelles and a crucial autopilot. The delayed third prototype with weight optimisation and increased use of composites will complete fabrication for a first flight before March 2014, according to current timelines. In April 2010, the DGCA had published an accident report that blamed multiple agencies, including NAL, the IAFâ€™s Aircraft and Systems Testing Establishment, and even US firm Pratt & Whitney, which supplied the aircraftâ€™s turboprop engines. For NAL, the resumption of flight test will be an emotional time. The establishment was thrown into gloom following the March 2009 crash and the programme has remained on ground ever since, with confidence taking its time to build within the agency. Now also saddled with the National Civil Aircraft Development (NCAD) programme, NAL has its hands full. The agency has proven its abilities by branching out into partnerships with Mahindra on the NM5 and developing mini-UAVs, but the IAF will be looking keenly now at the Saras flight test programme as it resumes. GSLV Mk III, Anees and Sancho like this. 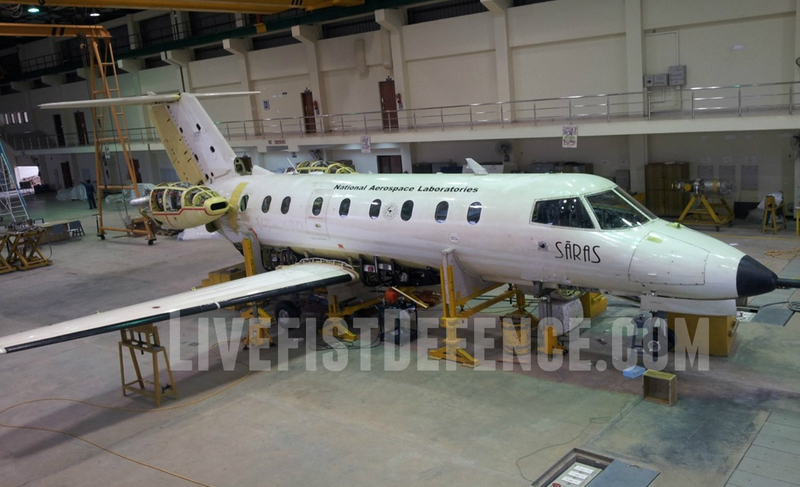 Why has it taken eight years for the SARAS programme to be in a position to return to flight test? After the unfortunate accident on 6th March, 2009, all the activities related to SARAS aircraft had to be stopped till completion of accident investigation by DGCA and subsequent implementation of recommendations thereon. The investigation absolved CSIR-NAL of any design deficiencies, but attributed the cause to procedural deficiencies. Other major factors for this delay in resumption of programme were: Change of Regulatory body from DGCA to CEMILAC to meet certification requirements of IAF as the possible launch customer; re-orientation time for CSIR-NAL to the procedures of military certification agency and the time for the regulatory body to get a grasp on the project, as the entry was lateral and at an advanced stage of project. By the time the first prototype was modified and ready for Taxi trials at the end of year 2013, the project had reached its date of completion and CSIR-NAL had to wait for a formal approval from Govt to continue further. This was crucial as the project had important stake holders like HAL, IAF, CEMILAC and DGAQA towards further flight testing and certification of SARAS. What challenges have been faced by the programme in the last eight years, including the lessons learned from the 2009 accident? The main challenges faced were / are heavy attrition of trained human resources, obsolescence of critical aircraft systems and LRU’s, vendor reluctance to respond to CSIR-NAL minimal requirements (which is specific to prototype development wherein only one or two systems are built), availability of experienced Test pilots for twin-turboprop configurations for full project duration, availability of dedicated staff from regulatory body due to their preoccupation in several projects of national importance and fund availability for prototype development activity with inbuilt risk of failures. What specific changes have been made to the first prototype compared to its earlier configuration? Major changes made to the first prototype, termed PT1N, are upgrading the propulsive system including efficient nacelle, larger metallic rudder for improved controllability, new landing-gear actuators, new brake system to cater to the needs of higher AUW, improved FCS, flame resistant design for nacelle etc. What are the flight test/IOC/FOC delivery timelines for the SARAS? Can you share figures of total expenditure on the project so far, plus intended expenditure until delivery to customer. Shortly, CSIR-NAL will carry out flight-testing and evaluation of PT1N aircraft which will provide essential information towards arriving at aircraft configuration for the subsequent weight optimized build for Limited Series Production. Also the developmental flights of Saras PT1N will lead to evaluation of performance and handling characteristics of the aircraft to fine tune the design modifications. This would further pave the way forward towards arriving at an aircraft which will be suitable to meet the IAF requirements through LSP phase. Total approved budget for the 10thplan proposal project “Spearheading small civil aircraft design, development and manufacture” is INR 297 crores. It is prudent to mention here that the Human resources created in all aspects of civil aircraft design, prototype manufacturing, development of machining centers across the country which can produce airworthy components, the assets like excellent aircraft hangar, state-of-the-art telemetry centre etc., far outweigh the money spent on the project. What is the productionisation/manufacturing plan for SARAS — what is the sales/export forecast? Once the aircraft is mid-way to certification and the final SOP is frozen, an industrial partner will be identified towards productionisation /manufacturing. Initially IAF has shown interest in acquiring 15 aircraft and it is hoped that this could further go up to at least 50. What new roles are envisaged from the SARAS other than light commute and logistics? SARAS can also be useful for Air ambulance, Maritime Patrolling, Border surveillance, Commutation for regional connectivity and Special Missions. Apart from these applications, SARAS can be used as an excellent flying test bed for new LRU development and qualification. This is so because of the simple reason that the build of SARAS is totally indigenous and can be updated or modified for LRU testing and qualification. What is the current status of the National Civil Aircraft (NCA) programme of which NAL is an integral part? At CSIR-NAL, studies have been carried out regarding developing a Regional Transport Aircraft (RTA). The feasibility study indicated: about 250-300 aircraft for India (20 year demand forecast), international market demand for over 7000 RTA class of aircraft and military transport of this class in India : ~150 aircraft (replacement for An-32 and HS748). The suggested model by the High Power Committee is technology development funding by government and equipping/manufacturing in a JV/SPV mode. Presently, CSIR-NAL is contemplating on Phase 1 of the development (ie.) preliminary design phase (PDP). It is envisaged that, CSIR-NAL along with public/private partnership can come together to take this initiative forward with the government. What is the export scenario of NAL aircraft and systems at this time? CSIR-NAL is planning for 2 seat ab-initio aircraft Hansa – Next Generation with advanced features aimed at low acquisition cost, low operating cost and minimum maintenance. The project once approved and implemented, we envisage the private partner to take up production and marketing not only catering to Indian market but also to other developing countries. Further, we are in partnership and collaborative mode with M/s Mahindra Aerospace for the development and certification of CNM-5 aircraft both in India and Australia. While the certification of CASA in Australia will be the responsibility M/s Mahindra acquired Gibbs Aerospace, discussions are in progress with Mahindra Aerospace for manufacturing Five Seat General Aviation Aircraft (CNM5) Prototype Leading to FAR 23 Certifications by the Directorate General of Civil Aviation (DGCA) in India. With Indian and Australian certificate in place it would be easy for us to market the CNM5 aircraft abroad. GuardianRED, Levina, GSLV Mk III and 7 others like this. GuardianRED, GSLV Mk III, Abingdonboy and 2 others like this. GSLV Mk III, Abingdonboy, ni8mare and 1 other person like this. they should just rope in Mahindra as a partner for this. Their diligence is way too tardy. The consulting org that was borught in after the crashes was very stinging on the design and safety. What do Mahindra know about designing/validating/testing an airplane? As noted in the interview above, post the crash many lessons have been learnt and more stringent procedures adopted. The only way they will learn is through a process of trail and error, they won't always be succesful. Similar to the LCA project, the fact is that it is essential to keep going with this first of its kind project. An Indian, zebra7 and Agent_47 like this. They're building up a good history of working with Govt Labs to commercialize products. They don't wait for 2 decades to develop products. They have more aggressive timelines, very good at commercialization. Notsuperstitious, Abingdonboy and GSLV Mk III like this. Why go with a lateral-rear nacelle with a push prop and a high -T tail config . Why not just design something traditional like a do228. Seriously I don't know why nal chaps want to run before they can walk??? Who approved these projects? Why go with a lateral-rear nacelle with a push prop and a high -T tail config . Why not just design something traditional like a do228. Seriously I don't know why nal chaps want to run before they can walk??? I hope it's done by 2050....Or atleast before I die...I want to fly in it. I think instead of turbo prop engine, the turbo fan engine should be also be consider. Heard that Saras is over weight, any comment on this regard. At a later stage there's no reason why not. NAL have worked on this and will have fully addressed the problem for their upcoming prototypes. NAL Saras dead, Is US2 aircraft an option ?